It's national politics that get the headlines, but corporations are making the most headway on their anti-worker agenda by buying state legislatures. So argues Gordon Lafer in his new book, The One Percent Solution: How Corporations Are Remaking America One State at a Time. You may think you know how pervasive corporate money is in politics, but Lafer, a labor educator at the University of Oregon, reveals a nationally coordinated, corporate-funded strategy that's gained steam since 2010. It's a plan to destroy unions, cut public services, and attack voting rights, while protecting corporations and the rich from backlash. Chris Brooks interviewed Lafer about what this operation means for union activists. An excerpt from Lafer’s book is available on the Labor Notes website. Chris Brooks: You argue that corporations' spending on state politics really took off after the 2010 Supreme Court decision in Citizens United. Gordon Lafer: My most important goal is to get people to look behind the politicians and behind the political parties and to look at corporations, which are the most important actors in American politics. Even before Citizens United, corporations outspent unions 10 to 1. Since 2010, when the Court decided to allow unlimited corporate spending on politics, that spending has increased about 600 percent. These corporations try to hide their actions by acting through organizations with nice-sounding names like “Americans for Prosperity,” funded by the Koch brothers. For example, recently stories started to appear about the American Action Network, an organization that appeared shortly after Citizens United with deep ties to Karl Rove and the pharmaceutical industry. It put up $20 million to start pushing political ads aimed at members of Congress who are swing votes on tax cuts for corporations and the rich. When this gets reported in the mainstream press, they say American Action Network is a conservative group that raised $20 million for ads, as if they are just a group of citizens that has been successful at raising money, instead of naming the fact that this “network” is a vehicle for corporations. Like many people I am suspicious of the influence of corporate money in politics and I assumed Citizens United made this worse, but I had no idea how much of an impact it had at the level of state government. Citizens United was a federal decision, but until 2010 there were 22 states that had their own laws barring or limited corporate spending in politics. All of those were invalidated by the Supreme Court decision. Following that decision, 11 states went from either mixed or Democratic rule to being wall-to-wall Republican, with the GOP in control of both houses of the legislature and the governor’s office. Critically for the labor movement, this included a swath of states in the upper Midwest that included Pennsylvania, Ohio, Indiana, Michigan, and Wisconsin—states that were historically union strongholds and swing states in national elections. State elections are cheap to buy. Almost no one knows anything about their state officials. Candidates don’t have name recognition and big bases of loyal voters to counteract the power of money. This is why, if you look at the local, state, and federal levels, corporate power is strongest at the level of the state. To take one example, in North Carolina there were a number of organizations controlled by Art Pope, a veteran free marketeer connected to the Koch brothers. In 2010, he put up several million dollars and targeted 20 legislative races, which doubled the campaign budgets in those races from the previous election cycle. Eighty percent of his candidates won and with his help, both houses of North Carolina’s legislature became majority Republican for the first time since Reconstruction. So this led to what you call the “nationalization” of state politics. What we have now are corporate lobby groups that write bills and get them introduced in legislatures across the country simultaneously. This is achieved through ALEC, the American Legislative Exchange Council, which has brought together state legislators and several hundred of the biggest corporations in the country, such as Ford, General Motors, GE, Facebook, Google, Microsoft, Blue Cross Blue Shield, McDonalds, Amazon, and Walmart. About a quarter of all state legislators are members of ALEC. They meet several times a year and they sit in committees that are half state legislators and half corporate lobbyists, and they write bills together. Those bills are then introduced in cookie-cutter fashion in state after state. Then these same corporations that are members of ALEC fund these candidates’ campaigns, and spend their own money on advertising on TV, radio, and social media. These same companies also fund a network of state-based “think tanks” called the State Policy Network, which write white papers in support of corporate policies and produce so-called experts who testify in committees and push their policies on television and radio. And then there are also business-backed advocacy groups, like Americans for Prosperity, that pressure politicians to support ALEC legislation. Everyone assumes that these corporations are just trying to get money in their pockets. And it’s true that they are. Coca-Cola joined ALEC and it lobbied against restrictions on sugary soft drinks. Payday loan companies are members of ALEC; they've successfully lobbied against laws to cap interest rates at 36 percent. And corporations don't want to pay state taxes, either, so they shrink the size of government so there is less to pay for. But in addition to that, the corporations are strategic. They are trying to accomplish goals that are not about immediately benefiting their bottom line, but about hobbling the ability of working people to change the balance of power. For example, the Chamber of Commerce and Republican Party in multiple states say that passing right-to-work legislation is their number one priority. Only seven percent of the private sector is unionized, so why would this be their number one priority? Because they want to undermine unions now, to limit the possibility down the road that workers will organize. Republican operatives know that unions fund Democrats. And unions are the primary political force behind raises to the minimum wage and other policies that benefit workers generally. Union organizing tries to ignite a revolution of rising expectations. If a group of employees have a terrible boss and they take collective action and win, then that collective action can embolden them. If they have a successful contract fight, then they might decide to get involved in politics and try to change their state’s policies. Each victory can ratchet up what people can aspire to. For corporations, high expectations are dangerous. One of the things that ignites expectations is when there is a gap between what people believe they have a right to and what they are actually getting. So they try to systematically ratchet down our expectations, both of the government and of employers. If parents have a kid in a classroom with 37 other kids, they'll think, “well, at least it’s not 45.” People might think they have a terrible job, but at least they have a job. When corporations are pursuing an agenda that is going to result in the majority of people seeing their livelihoods decline, they don't want you to think you have a right to the opposite. Do you think you have a right to a library in your neighborhood? Do you have a right to a bus route that doesn’t cost too much? When all those rights get taken away, it diminishes the idea that citizens can make demands on government to provide for the greater good. So even in states where pensions are well-funded and easily affordable, ALEC insists the government should replace defined-benefit with defined-contribution plans. We see this also in attacks on prevailing wage for construction workers [where specific wages, usually union level, are required by law on publicly financed projects]. When non-union workers go from working six weeks on a public construction job, which pays union wages, to their next project in the private sector where they are suddenly making $12 an hour less, they begin to realize that they need to be in the union. Between 2011 and 2015, nine states either eliminated their prevailing wage standards or restricted their coverage. As soon as Hurricane Harvey started raining over Houston, the corporate-funded “Americans for Tax Reform” started calling for prevailing wage standards to be waived for the massive work of rebuilding that city. The Chamber of Commerce, Americans for Prosperity, ALEC, and other players in the business lobby have made education “reform” one of their top priorities. In fact, you describe school reform as the “perfect crystallization of the corporate legislative agenda.” Why? If you hear these corporate lobbies and the Republican Party railing against the “entitlement mentality,” they’re not just referring to food stamps or Medicare, which people can and should feel entitled to, but to the very idea that Americans can feel entitled to any public services just by virtue of being members of society. The right for your kid to get a decent public education is one of the single biggest remaining rights that people universally believe that they have. So by destroying public education, which is what their brand of “reform” means, the corporate lobby is trying to break down the entitlement mentality. Also, many corporations stand to make a huge amount of money by privatizing public education. There are multiple conferences every year that bring together education policy makers, entrepreneurs hawking all these digital apps for education, and high finance, meaning investment banks, hedge funds, venture capital, private equity. Every major Wall Street investment bank now has a division specifically devoted to K-12 education. ALEC and the other corporate lobbies are pushing laws that demand that digital, online classes have to get the same dollars per student as regular, brick-and-mortar classes taught by trained and certified teachers. That means that the profit margins are enormous. Their strategy is dependent on the use of test scores to hold schools “accountable.” Many states have passed laws mandating that “persistently failing schools” must be forcibly converted to charter schools or turned over to some special unelected authority that then goes in and busts the union. This “accountability” is also applied to teachers. So tenure, pay, and job security are now dependent on student test scores. What is telling is that the corporate lobby promotes private schools and charter schools that don’t have accountability. In state after state, charter schools are exempt from basically every state regulation except fire codes. Part of their ultimate goal in education is to voucherize the whole thing, which they are moving toward pretty quickly. Then when your kid’s education is terrible in the new private school or charter school, it’ll be like your health insurance. Everyone hates their health insurance company, but what are you going to do? There is no one to complain to. And maybe you were a “bad consumer” and didn’t “do enough research” into what the plans are. That is what they could turn public education into. The corporate lobby also exploited the budget crises during the Great Recession? 2010-2011 saw the biggest state budget crises in many decades. These budget crises were never caused by overspending in the public sector, but by the Great Recession, which itself was the result of the Wall Street scam that collapsed the economy and the subsequent collapse of housing prices. Many local governments are dependent on property taxes, so the crisis hit them particularly hard. These crises were used by the corporate lobby to demand that the government cut public services and make cuts to the wages and benefits of public employees. A number of alternatives could have been pursued. In the year of the worst budget deficits, all the budget deficits in all 50 states could have been completely wiped out if state governments had done two things: one, undo the Bush tax cuts for people making more than $250,000 a year, and two, make the people whose income is based off buying and selling stocks on Wall Street pay the same income tax as everyone else. Both of those things could have been done at the state level and would not have required Congressional action, yet not a single state contemplated those actions. Instead, what we saw is that many states controlled by corporate-backed legislators enacted new, generous tax cuts for corporations and the rich at the same time they were cutting essential services. One of the most striking cases for me was Ohio in 2011, where they eliminated full-day kindergarten the same year they eliminated the state’s inheritance tax, which only ever affected the wealthiest seven percent of people in the state. We also saw when the economy rebounded in 2013-2014 and tax revenues came back, they did not restore services they cut—instead they created new tax cuts for the rich. In Wisconsin, one of the ratings agency produced a report measuring the state’s fiscal health. It pointed out that every time the state came back to fiscal balance, the legislature and Governor Walker instituted new tax cuts that sent the state back into crisis. They were actively creating the budget crisis. 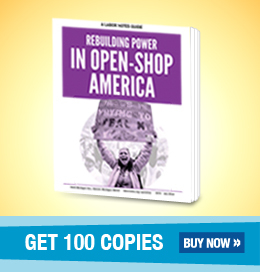 What can unions do to fight the influence of corporate money at the state level? Without pretending to have “The Answer,” one thing that’s clear is that when progressives can fight around an issue—rather than a personality or a party—it’s much better. That's because on an issue-by-issue basis, the corporate agenda is very unpopular. This makes it smart to run ballot initiatives. Majorities of both Republican and Democratic voters support a higher minimum wage, a right to sick leave, fair scheduling, affordable health care, and good public services. And unions, especially public sector unions, need to run contract campaigns focused on demands that serve the interests of the public as well as union members. When bus drivers demand better service to poor neighborhoods, librarians demand longer hours, county health workers demand more clinics, or teachers demand smaller classes, this not only creates community alliances that strengthen the union’s bargaining position—it also raises people’s sights and restores their ambitions for what we all have a right to demand from our governments.